La Tinaia is a lovely 1-bedroom apartment here at Podere Patrignone in Tuscany at the south-side of the Podere Patrignone estate. It was not on the original purchase plans back in the 1980’s but my father found a door buried under a huge bramble bush when they were clearing the site, and inside were the large beautiful wine-barrels where they used to store the chianti wine. Hence the name, "La Tinaia", which means wine store. My father used much of the old chestnut and oak wood from the barrels to make the furniture in Tinaia, especially the large beautiful kitchen table. Tinaia has a lovely sunny rear garden with views over our olive groves, forests, and the vineyards beyond. Inside, there’s a good-sized kitchen, dining area and living area, with a large fireplace, The fire is lovely to use in the Spring and Autumn, and it also heats the bedroom and bathroom radiators. The bedroom itself has a lovely east-facing window, and large king-size bed, dressing table and wardrobe, and leads on the lovely bright bathroom with an enamel bath, shower, toilet, bidet and wash basin. There is a shared swimming pool with the most amazing views, an Honesty Bar fully stocked with my favourite local organic wines and spirits, free Wifi, and of course, you can always borrow our dogs and go for long walks. This apartment rental is a favourite for all romantic couples, and usually fills up fast, so book early to avoid disappointment. You find out more information on our website: look for "Podere Patrignone"
If Tinaia isn't available for the dates you want then please email us and we'll let you know what else is free. Patrignone is right in the middle of Chianti, at the epicentre of Tuscany's cultural treasures, just 10 minutes from the beautiful hill-top town of Castellina in Chianti, with its full complement of restaurants, cafés and shops (and a small supermarket). Siena is just 35 minutes away, and Florence 40 minutes in the other direction, San Gimignano is 30 mins away, with Volterra the next village along. You really couldn't pick a more central location. There's no doubt that you'll need a car to get the most of Chianti's nooks and crannies, but if you feel like venturing further afield, within a 1.5-hour drive you'll find white sandy beaches, typically beautiful seaside resorts, dozens of hot springs, and the majesty of the snow-covered Apennines, clearly visible from Patrignone's terracotta terrace. And if you're into cycling, tennis, golf, ballooning or fishing, these activities and more can easily be organised. Just let us know what your interests are, and we'll give you some options. Simon Zimbler - owner, manager, olive farmer. 'I live and work on our family’s olive oil Agriturismo in the heart of Chianti with my wife Verity and our three children. We moved to Italy in 2007 to take over the business founded over 25 years ago by my Italian mother. I'm a keen cook, I love wine, and I have an extensive knowledge of the restaurants and wineries around here. For 7 months of the year my main job is to help and advise our guests and to make sure they make the most of their time in Tuscany. The rest of my time is devoted to my beloved olives, and to making sure my extra virgin olive oil is the envy of our neighbours. And there’s always time for a swim with the kids in the pool.' Verity spends much of her time tending her organic 'orto' (vegetable garden), cooking her 4 course weekly banquets for guests, preparing fresh loafs of bread for new arrivals, looking after our chickens and dogs and boys! Verity sources all of our food from local producers and will be more than happy to share her top shopping tips. "My mother moved to the UK when she was 14, but always vowed to move back to her native country at some point. She started looking for a suitable 'project' in Tuscany in the early 80's, and finally settled on Patrignone on 1985. And who wouldn't! She picked Patrignone because she wanted somewhere completely isolated, not overlooked by neighbours, and with a private road not used by anyone else. And, of course, she fell in love with Patrignone's amazing sunset views." Simon & Verity work hard to make this a home from home and you will be greeted with a welcome pack containing freshly baked bread, local cheese and sliced meats, fruit, tea & coffee, salt & pepper, a bottle of local organic Chianti and our own organic olive oil. We have lots of knowledge about the local area and will be happy to help advise you on places to visit and to eat at. Well, it really is very beautiful here. You can offset the carbon you have used to get here as we are 'carbon positive', getting our power, hot water and heating from the sun and our woods. We're surrounded on all sides by cypress trees, vineyards, and our olive groves. We're on top of our own hill so we have the most amazing views as far as the Apennines. So it's very peaceful and quiet here, and yet we are perfectly situated, just 45 mins from Florence, 35 mins from Siena and surrounded by beautiful hill-top Tuscan towns, the nearest of which is Castellina in Chianti, just 10 minutes away, and well-stocked with shops, bars, excellent restaurants, a brilliant butcher and a good supermarket. The property was exactly as described. The owners spend a lot of effort to make sure everything is very clear and even prepare a "book" for you about the property and things to do in the area (day trips, restaurants, wine tasting, etc.) My wife and I loved it here. The property is very central in Tuscany and is great for making day trips. The arrival snacks and honesty bar are a great touch. If you are a couple looking for a romantic place to relax in Tuscany that is central enough for day trips, this cottage could be for you. It is old and rustic, which means it's not like staying in a 5-star hotel. 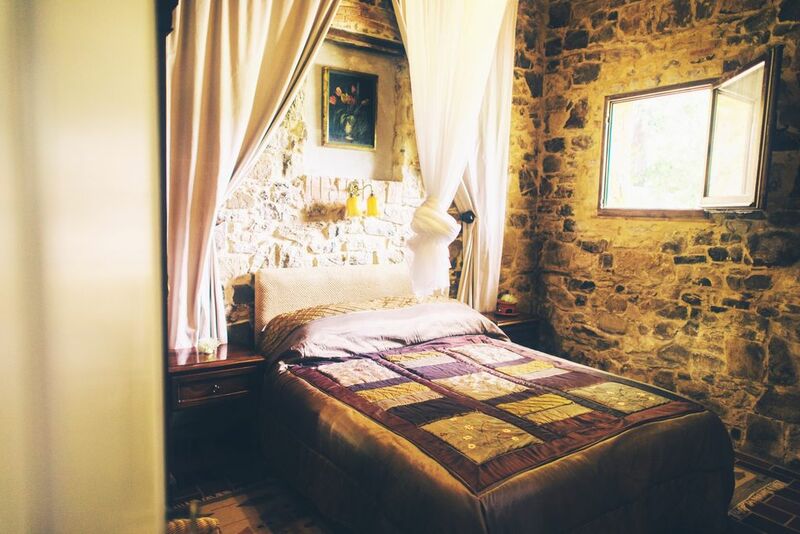 But it has loads of charm and is quite cosy - perfect for a romantic getaway. We enjoyed the property and hiking through the woods and olive groves. We would definitely stay here again on another trip. Highly recommended. Hi Dan & Ashely, and thank you for choosing Podere Patrignone for your 10th anniversary celebrations. We're very glad we could play a small part in your fabulous holiday. It was a pleasure to meet you both. All the best to you both, Simon. Nine of us, four children and five adults, just returned from an Italian adventure of a lifetime. The highlight of our trip (agreed by all) was a wonderful week at Podere Patrignone with Simon, Verity and the boys. The beauty of the property and Tuscany can be viewed in photos, but, in reality, exceeds all expectations. Patrignone is the perfect, stress free base to relax, enjoy and explore. The opportunities to visit, dine and experience authentic Italy are easy and numerous. Cycling in the area is sublime - the rolling hills, good roads and low traffic made for unbelievable and challenging road bike riding. Our best day was spent on rented e-bikes (with the kids age 12 and 13) touring San Gimignano and surrounding area. Although the boys (age 11, 12 and grown up) might say our evening encounter with the "wild" boars was memorable! We stayed in the 7-bedroom villa which was historic, charming, well appointed and extremely comfortable. We loved unwinding, and comparing stories and tips with fellow travellers while enjoying sunsets, swims and Chianti each evening. What made our visit so extraordinary was the effort, personal touches and hospitality of Simon and Verity. From the pre-arrival information, to the welcome snacks (olive oil, fresh baked bread, cheese and wine), the homemade Tuscan feast, the walking maps of the area, the well stocked hospitality bar, to the assistance with reservations and help with the local bike shop, the family went above and beyond to ensure our stay was easy, perfect and memorable. We are so grateful to have found this idyllic, and joyful place - and hope to return! We could not have picked a better place or hosts for our first week in the Tuscan countryside. Simon and Verity's place is well off the beaten path but worth it in terms of intimacy and privacy. The apartment is smallish but just right for 2, the grounds of Podere Patrignone are breathtaking - the middle of an olive farm, with vistas of the valley and mountains, a gorgeous veranda to do work on or just enjoy the sunset with a glass of locally grown organic wine, and a welcome pool to take the edge of the hottest Tuscan daytimes. Thanks guys! Was lovely to meet you both and spend time with you. You are the perfect guests, so feel free to come back as often as you like! This lovely working farm, with its friendly hosts Verity and Simon is a real treat. It is the ideal place to get away from it all. The apartment is well appointed, and the welcome of fruit, ham, milk, and bread was a real treat. The guest lounge is a perfect facility to check your internet or have a cool wine. The pool is gorgeous and the vistas and views are simply breathtaking. Hedges of rosemary, swallows in the evening and what more can you ask for. What a lovely review! I think you've captured the essence of Podere Patrignone perfectly. Thank you both for spending time with us.